Fourteen years ago Nelson Mandela used the 1995 Rugby World Cup to unite black and white South Africans. A film based on the historic event, Invictus, opens on Friday and has raised the question: Has the dream of transformation lived on? Both the film and the book on which it is based - John Carlin's Playing the Enemy - have a fairytale ending, but this is not necessarily the case for South Africa today. Today's racial tensions are a lot more subtle. Most black and white South Africans have embraced each other's differences but every once in a while the country's apartheid past rears its ugly head. When political leaders fail to agree, they often accuse each other of being racists. But jobs previously reserved for white people are now accessible to blacks. White and black South Africans can socialise without fear of victimisation. 39% find people of other races "untrustworthy"
There are no "whites only" or "blacks only" signs hanging in restaurants, on buses, on beaches or airports. But a new study suggests that much work needs to be done to achieve the goal of a "rainbow nation". The study by the Institute for Justice and Reconciliation used a sample of 3,500 people. According to the survey, 24% of South Africans said that they never spoke to people of other races on a typical day. And 46% admitted to "never socialising" with people of other races in their own homes or friends' homes. Mr Mandela used rugby to preach transformation and reconciliation to South Africans - it was one of the first fruits of his "rainbow nation". But still rugby remains a predominantly white man's sport. And equally football remains a predominately black sport. So have South Africans forgotten Mr Mandela's message? 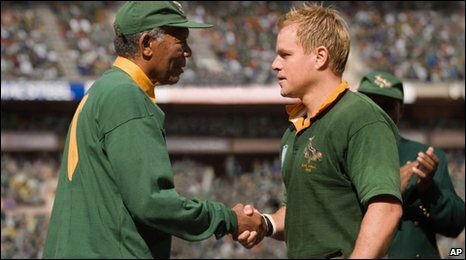 South African actress Marguerite Wheatley, who plays the wife of former national rugby captain Francois Pienaar (played by Matt Damon), was 14 years old when South Africa played New Zealand in the momentous final. She says she was "oblivious" to apartheid South Africa and what the rugby match meant to the dream of a "new South Africa". so it was very confusing for me as a teenager," she says. "For us young people it was easier to accept each other. I can't remember much about apartheid [but] I know that when apartheid fell, they were saying 'Our country has gone to the dogs'." Wheatley says although South Africa was brought together "forcefully" most South Africans are looking at working together to continue building the nation. "We're figuring out, we're sorting it out," she says. Hollywood star Morgan Freeman, who has visited the country a number of times, says there is still "energy" in South Africa reminiscent of the 1995 World Cup victory. "I made two visits here, one during the transition when it was so volatile and at Madiba's 80th birthday I came back and the place was absolutely electric with promise," says Freeman. "You don't feel this electricity right now but you feel the energy, this feeling, sense of promise. You feel that there is still this sense of promise that now we can get moving." 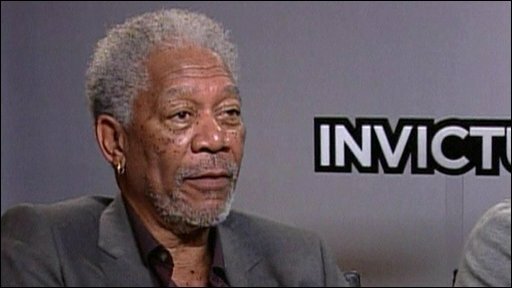 Film critics are already predicting that the movie will earn Freeman an Oscar. The actor, who is also one of the film's executive producers, plays Mr Mandela - a role with the potential to catapult any actor's career to world acclaim. Freeman says he was "blessed" to have access to Mr Mandela. "I studied him; I had close access to him," he says speaking about the man he describes "a friend". "Not only was I able to look at tapes and get mannerisms and the walk, I was able to sit and hold his hand and talk to him." Freeman says one of the challenges of accurately portraying Mr Mandela was learning how to speak like him. "Nobody else sounds like him; it's a very distinctive voice, so I had to work on that," he says. The film is directed by veteran actor Clint Eastwood and includes a local and international film crew. In recent weeks, local actors' unions have complained about Hollywood actors playing lead roles in films portraying South African icons and say South Africans should play more prominent roles in big productions. But producers argue that using well-known names draws in crowds and goes a long way to ensuring the film's success. Invictus has a strong presence of local actors, although they are not playing lead roles. The name of the film is derived from a poem by William Ernest Henley which Mr Mandela is said to have memorised during his years imprisoned on Robben Island.